JAN: It's the moment we've all be waiting for. Halle's new thriller Come and Find Me is about to hit the shelves. It's about a recluse who works and lives online who must now brave the real world when her sister goes missing. I asked Hallie to tell us about her recluse protagonist, Diana Highsmith, a computer security expert and reformed hacker and how she came up with her character. HALLIE: The inspiration for Diana in "Come and Find Me" came to me when I tripped over an ad for a year's supply of dehydrated and freeze-dried food. 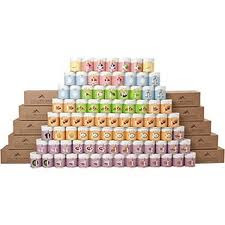 The photo showed a pyramid of cans in lovely pastel colors. Chirpy ad copy explained: "...this package will give you variety, nutrition, and peace of mind." Now, maybe if I lived on the San Andreas Fault or in a floodplain I might have ponied up $999.99. But instead I sat there trying to imagine who in the world would see 84 gallon-sized cans with a shelf life of up to 25 years as the ticket to peace of mind? The answer was Diana, a recluse who is afraid to leave her own house. Someone who's been traumatized. As I gazed out my office window, looking at the one-story ranch house next door, I imagined that the person lived there. JAN: On the surface Diana seems completely different from your last protagonist Ivy Rose. Is she or are there any similarities? And how hard was it to create a completely different heroine? HALLIE: At one level they're very different. Ivy in "Never Tell a Lie" is married, pregnant, and desperate to have a child. Diana is single, a recluse whose only "real" friend, other than the ones she interacts with on the Internet, is her sister. Both books are about betrayal and trust. In "Come and Find Me," Diana has to brave the real world when her sister vanishes. Along the way, she has to trust real people or she won't survive. JAN: How did you go about your research into computer hacking and security? HALLIE: I used to work in high tech, so networking with old friends I found a couple of amazing experts on computer security, one of them an expert on cyber-terrorism, another an ex-hacker. They helped me understand why people hack, and what real dangers they pose. I envisioned Diana working in a virtual world where she could conduct business meetings, investigate security breaches, and "climb" Alpine mountains without ever leaving home. After a little research, I discovered Second Life on the Internet was just such a virtual world. Armed with enough information to be dangerous, I created an account for myself on Second Life and logged in. First, I created an avatar, a skinny brunette with attitude. I figured out how to make her walk, run, turn, sit, and it was so exhilarating when I finally got her aloft. It felt like I was perched on her shoulders (think: Harry Potter on the shoulders of the Buckbeak the hippogriff) as she soared over the island at the entrance to Second Life. Not so exhilarating was when, seconds later, she plunged into the virtual blue (very blue) ocean. I actually found myself gasping for breath. After that my computer crashed. Neither me nor my hardware were ready for SecondLife, so I turned to some generous folks who play and work in Second Life, and who let me ride shotgun while they went about their business in virtual reality. Among other things, I learned that a good percentage of female avatars are created by male players. I learned that even bucolic corners of the virtual world can be infested by "griefers," mischief-makers who rain down toasters or phalluses on unsuspecting players, and how genuinely terrifying it feels to have a cage dropped down on your avatar, even when you know it's "only a game." JAN: Where will you be talking about the book? HALLIE: First stop is Brookline Booksmith next Monday, March 21 at 7 PM. Then BookEnds in Winchester Thursday, March 24. Then I'm off to Florida, Ohio, Pittsburgh (A shout-out to Mystery Lovers Bookshop! ), Sacramento for the Bee Book Club, and more. I'm updating my web site with new events all the time. I hope lots of Jungle Red readers will COME AND FIND ME. I definitely will "find you"...as soon as I hit the store this AM and see about ordering it :o) And Second Life is addicting, no? Thanks, Maryann! Are you a SecondLife addict? Spill! My computer and my gaming skills weren't up to getting enough experience to get addicted. And if you've gotten this deep, I'm giving away a copy of COME AND FIND ME to a randomly drawn commenter! So please chime in! Sounds like a great read! We computer geeks love this kind of stuff. LOL! I love the way you came up with the idea - an ad for cans of food. Hmm, I could have done that years ago: my sister, a Mormon, always has a year's supply of food on hand. But did I? Heck, no! I, too, work in the geek industry, and can't wait to read the book. What an exciting and original story! I stayed up WAY too late, reading it.. Congratulations, Hallie! Hurray! I'm a bit of a hermit. I could (and do, actually) stay at home for fairly long periods of time, and be quite happy doing so. If I didn't have certain obligations outside the home, and a husband, it would be entirely too easy for me to become a person like your Diana Highsmith. Being an introvert is something I can see easily becoming agoraphobia. I look forward to reading COME AND FIND ME. Very much! Best of luck with the new book, Hallie. Where in Ohio are you going to be? Cincinnati, maybe? Tiger, Edith - who says girls can't be geeks. I did try to sand down my geeky edges to write this. And having friends still in high tech helped... a lot. Thanks, Hank, my treasured pal! Kaye - you've got a lot of kindred spirits out there. And the computer makes it all too easy. Karen! Oh, do COME AND FIND ME! 4/8-4/9 I'll be at the Mad Anthony Writers Conference which is in Hamilton - right near Cincinnati. It's a terrific conference that just keeps getting better, organized by some of the nicest people you'll ever meet, like the lovely Jane Biddinger. (there really was a Mad Anthony - his statue is right there in town.) I'll be there with my pal Paula Munier and Jane Friedman! I must make an unplanned trip to the bookstore today. I want this book now. Hallie, I grew up in Hamilton! (Which once actually included the exclamation point as part of its name, true story.) And I know exactly what statue you're talking about, right on the beautiful Great Miami River. We passed it daily when I was a kid. Will definitely be there. Squeee! Karen - last time I was there I stayed in a wonderful B&B, took a long walk over the river, across the opposite bank, and back. It was my first trip to the Midwest and I was smitten. Hallie, that makes me very happy, to know you enjoyed a visit to my lovely little hometown. In the 80's, a New York writer visited friends there and wrote a book called "Hometown", which was a fair success, although it bore little or no relation to the actual town of Hamilton. I've registered for Saturday, so happy that you mentioned this! I've been trying to justify the expense of other conferences, and failing, so having one in our backyard is perfect. Thank you. Look forward to seeing you there, and hearing your address! Wishing you great success with the new book, Hallie! Hallie, can't wait to read the book! And will you come to Texas, please???? this is a great book--can't wait for you all to read it! And I am definitely a non-geek, so don't think only computer nerds will enjoy:). Hallie, the book sounds great. I'm going right now to add it to my 'to order' book list. Happy St. Patrick's Day to all you ladies. Getting your book on my new nook, Hallie. Only my fifth e-book, so far! I'm ordering it on my Sony ereader tonight. Dang, Hallie, even as someone who pulls plots and characters out of thin air for a living, I'm blown away by your inventiveness for "Come and Find Me." I can honestly say I never in a million years would have thought of an agoraphobic computer geek. I can't WAIT to read this. 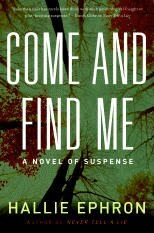 Great good luck with "Come and FInd Me"—it sounds like an enthralling read!